Our take on this classic Minecraft minigame has finally arrived, but this time with our won GCS twist. Beware, once you press the “play” button, everything breaks loose. You must have great stealth, as well as a quick wit in order to even come close to coming out on top. Do you have the skills to, not only defeat all your opponents, but also uncover power-ups that will aid you on your mission? The Ultimate challenge! Puzzle PE, as the name implies, is a game of which you will have to overcome seven levels (The Invisible Maze, Find the Button, Avoid the Red Block, Parkour Run, Speed Way, Archery, Invisible Parkour) in order pass and defeat this challenging puzzle, or obstacle course, if you will. Do you have the skills to pass overcome the many challenges that lay out ahead before you? Find out here. This a game all about mashing monsters – and a lot of them! With an infinite nighttime all mobs at let loose with nothing between them and you except for your armor and various weapons. After you (and your friends) defeat one wave of mobs, another wave will be randomly selected out of five separate waves ranging from easy zombies to beastly vicious vindicators. Will you defeat all five waves, and stay at the same time? Find out! You’ve been sent to jail! Welcome to Prisons. This map features an array of various mines for you to mine ores and other minerals. Once you have gathered up enough experience, you may buy more and better equipment from one or all of the four shops featured at the lobby. As you collect more and more experience, you gain access to better mines, such as the quartz mine, the diamond mine, the emerald mine (coming soon!) and the bonus mine. At the end of the lobby is also a PvP mine where you can battle with your friends to decide who gets the ore! Two Juggernauts (The Juggernaut and Juggernaut’s Henchman) will be randomly selected out of all the players, leaving the rest of the players having to survive against the Juggernauts. When the Juggernauts are released from their confinements, the battle begins. Who will win? The Juggernauts have diamond armor and swords, but the Survivors have health regeneration! Will the Juggernauts defeat the Survivors, or will the survivors come out on top? We’ll leave that for you to decide. This map requires at least four players. Once everyone have joined the game lobby press the Start button on one of the emerald blocks to start the game. Two players will at random be selected as Juggernauts. The rest of the players will get the role of survivors and their objective is to survive the vicious Juggernauts. You can’t wade in…you have to dive full on right away if you’re going to have any chance at beating your opponent in this game. Put your team shirt on, and jump off your dock to land into the water. Who ever swims the fastest and reaches the island in the center of the lake and takes the gold out of the chest first wins the round. Whoever wins ten rounds first wins the entire game! A simple fun and intense minigame for two players! Good luck! ​To start this game requires at least two players. Grab a shirt from the chest and put it on. Then start swimming for the island and if you get there you quickly need to get the gold ingot from the chest. If you do, then you’ll score a point! GCS has now released their own version of the classic game, Capture the Flag, or “CTF”, for short. This game is fit so that two to eight people can play the game at one time, starting once you enter the nether portal. The goal of the game? Steal the opposing team’s wool (representing the flag) with your “Flag Breaker”, and place back at your base. Many obstacles in the way between the two castles makes this game great fun, especially with more and more people after the precious flag! GCS Battle Grounds is a PvP minigame featuring three separate maps in one world as well as ten unique kits! Play against your friend, or a whole handful of people! Even form team to play against! This is basically a free-for-all (never-ending) PvP game which lets you pick a class of your choice and then instantly teleports you to the battlegrounds. This game starts as soon as anyone enters the battlegrounds. However, before entering you will be able to select a kit of your choice. Each kit has a unique set of powers and weapons. This is a simple PvP minigame where you can fight, build, and have fun with your friends! Every few minutes, all the glass that is placed is removed, having the game start all over again! As well as being able to fight with a stone sword, you also get a bow, with infinite arrows! 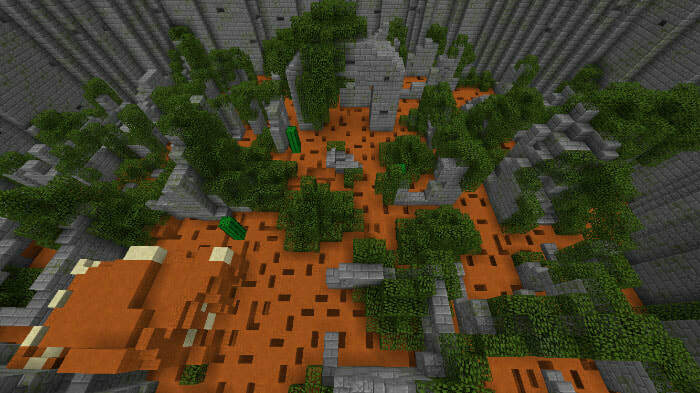 Run around the arena by yourself or with your friends and earn points (XP) every time you step on a block. If you fall into the void, well then better luck next time. Earn achievements and much more! This is a simple, but extremely fun minigame that can be played in single player or even better with a large multiplayer party!